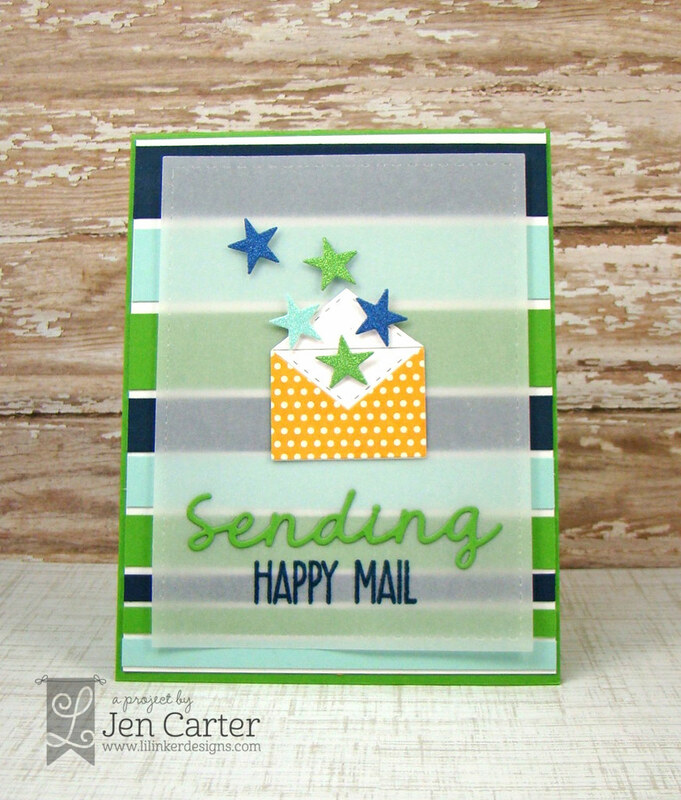 Welcome to the Clearly Whimsy Stamps August release BLOG HOP! 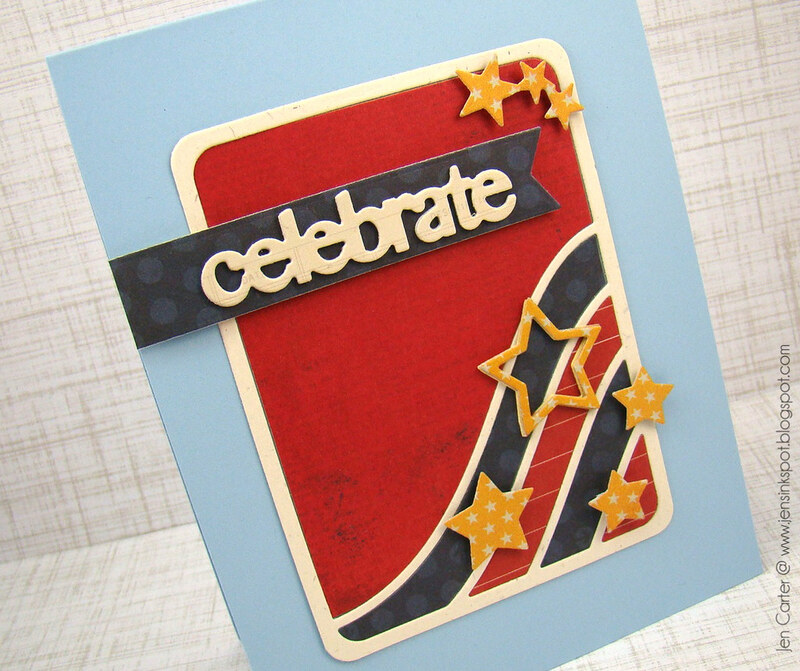 The Design Team and Guest Designers have been sharing some amazing creations made with these new stamps and dies over the last couple of days, and today we are celebrating their release with a GRAND BLOG HOP! The hop starts today and ends on Sunday August 31st at midnight EDT. 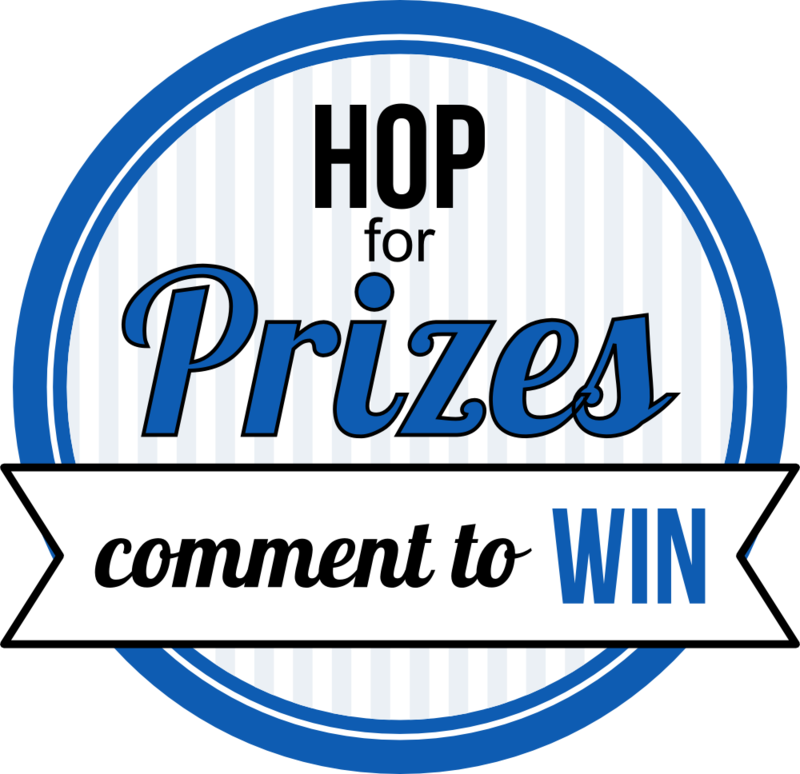 PRIZE ALERT ... We have hidden a fabulous prize of a $25 GIFT CERTIFICATE at one of the stops on today’s hop! We will draw the lucky winner from the comments left on the Whimsy Blog and on today’s design team posts, so be sure to visit everyone and leave a comment to be entered into the drawing. 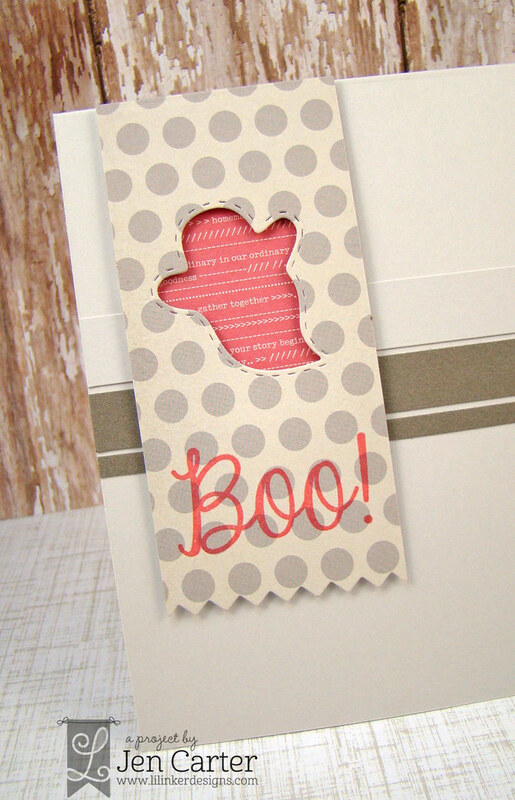 Please visit the Whimsy blog for a full reveal of this month's new release. 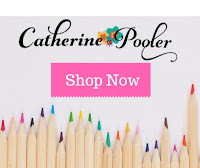 The entire new release is available to buy from the Whimsy Stamps store RIGHT NOW! This is a busy card, but I honestly have to say that I think it's my favorite of the ones I've shared for this release. 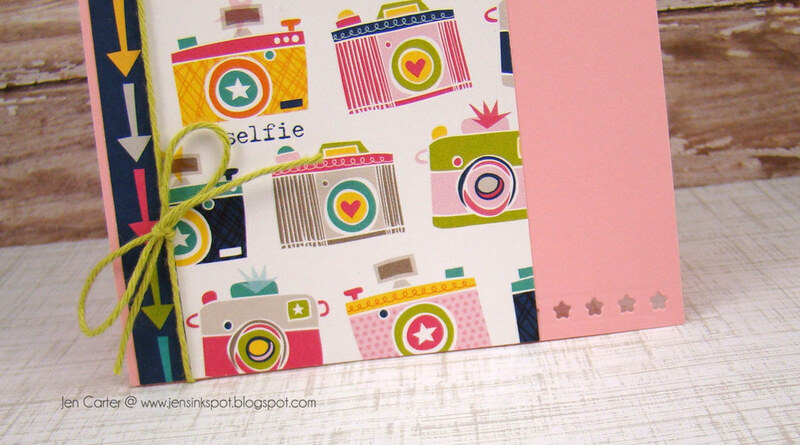 I chose a bold patterned paper (by American Crafts) and cut it down to the size of my card front. Then, I used the new Stitched Border dies to cut my paper apart. Leaving a gap the width I wanted, I trimmed the extra part of the patterned paper that I wouldn't need anymore. I chose a contrasting pattern to layer underneath the flower paper and then popped up the top panel. 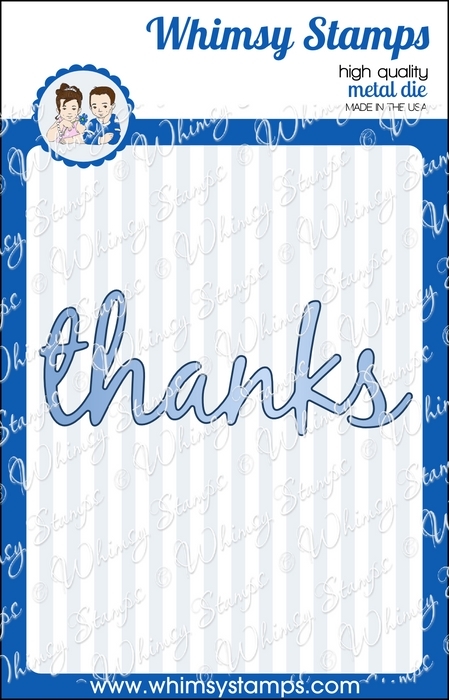 The "thanks" sentiment was die cut from the Thanks Large Word Die. I adhered it between the gaps that I created and then added a few gold sequins. Such an easy card! I hope you've enjoyed this release! Thank you so much for stopping by! 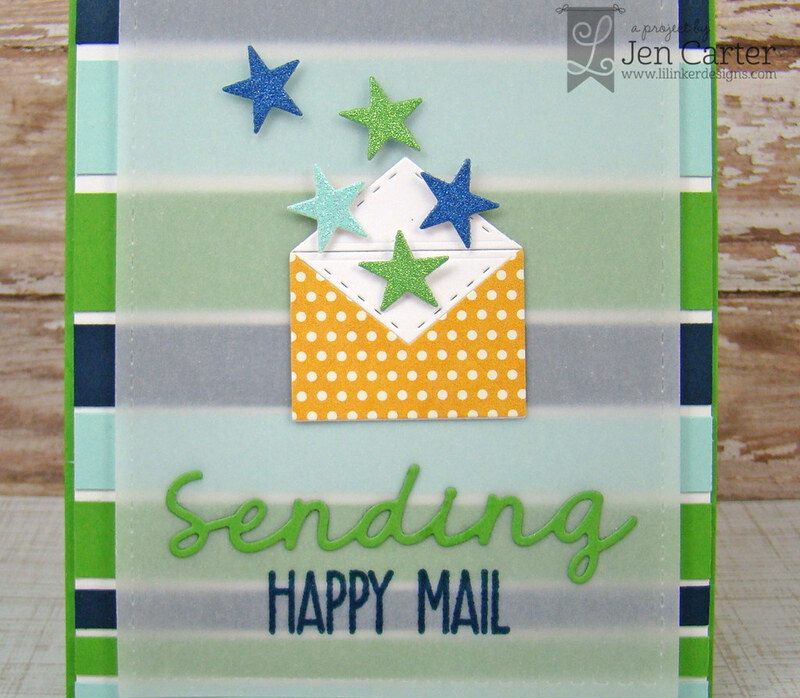 Hi everyone and welcome to DAY 2 of the Clearly Whimsy Stamps August Release! This week we are releasing 3 new clear stamp sets and 4 coordinating die/die sets, and they will be available to buy from the Whimsy Stamps store and Whimsy Stamps retailers TOMORROW. Yesterday we introduced THANKS A MILLION and BASIC BACKGROUNDS AND BORDERS 1, and today we are excited to introduce you to SAY WHAT? 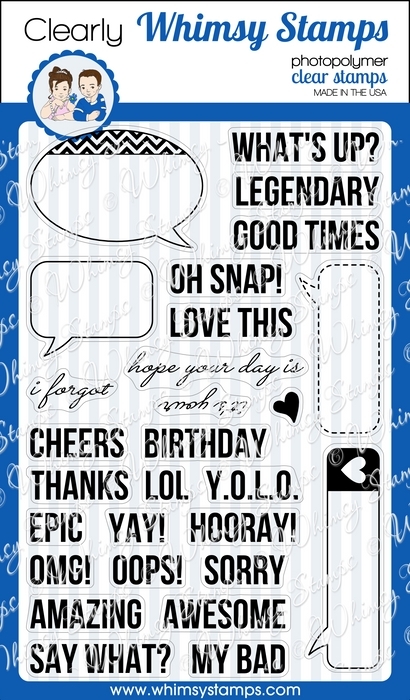 stamp sets and dies and the Speech Bubble Border Die! The new Speech Bubble Border die is fun! I decided to make the top portion of my card the speech bubble. I cut it out with patterned paper and really like how that turned out. I layered a white piece of cardstock underneath to give it a shadow. 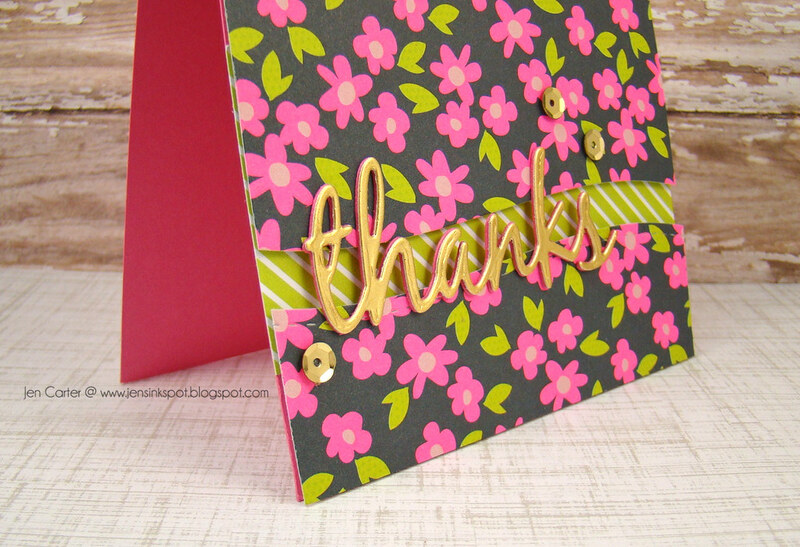 The "Thanks" is a new word die and I also cut two of those to create a shadow. 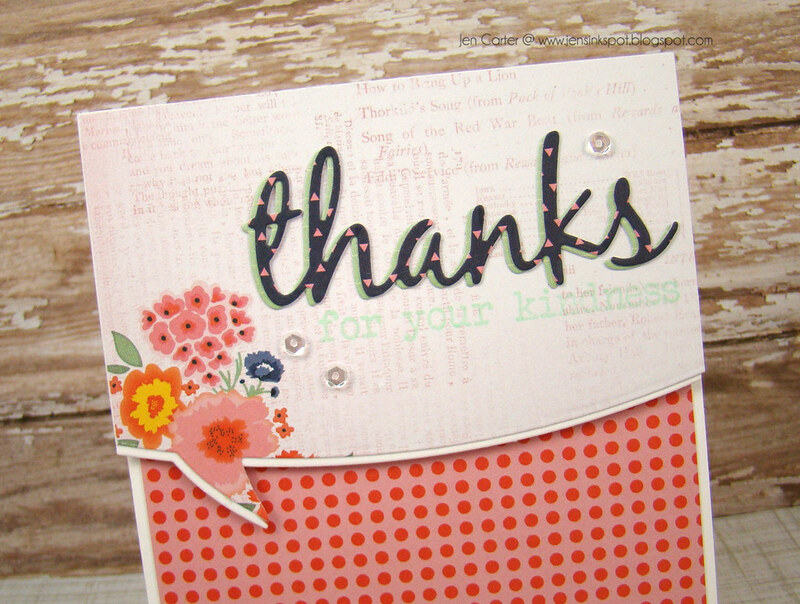 The sentiment, stamped in mint, is from the Thanks a Million stamp set. 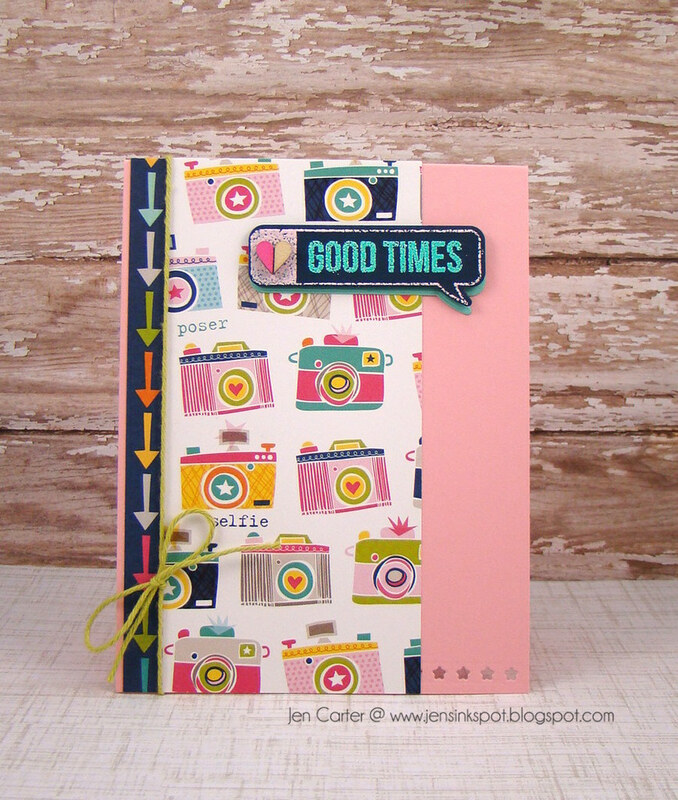 I really, really adore camera images so I thought it would be fun to pair the new Say What stamps and dies with this patterned paper. I really like the versatility of this set! I die cut the speech bubble and then embossed it with pink embossing powder. I then embossed the sentiment in aqua. One of the fun dies included in the Say What die set is this little row of stars. 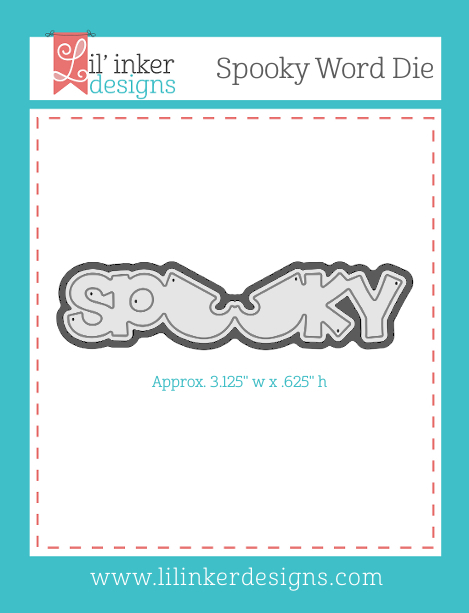 You can use this die wherever you'd like on your card! Hope to see you again tomorrow for our RELEASE DAY HOP and the final reveal of our last set of products! Thank you SO MUCH for joining me today! Boo to You! with Lil' Inker Designs! Welcome back to day 3 of the Lil' Inker Designs release! If you are following along in the blog hop you should have come from Heather Campbell's blog and if you'd like to start at the beginning, visit Laura's blog! 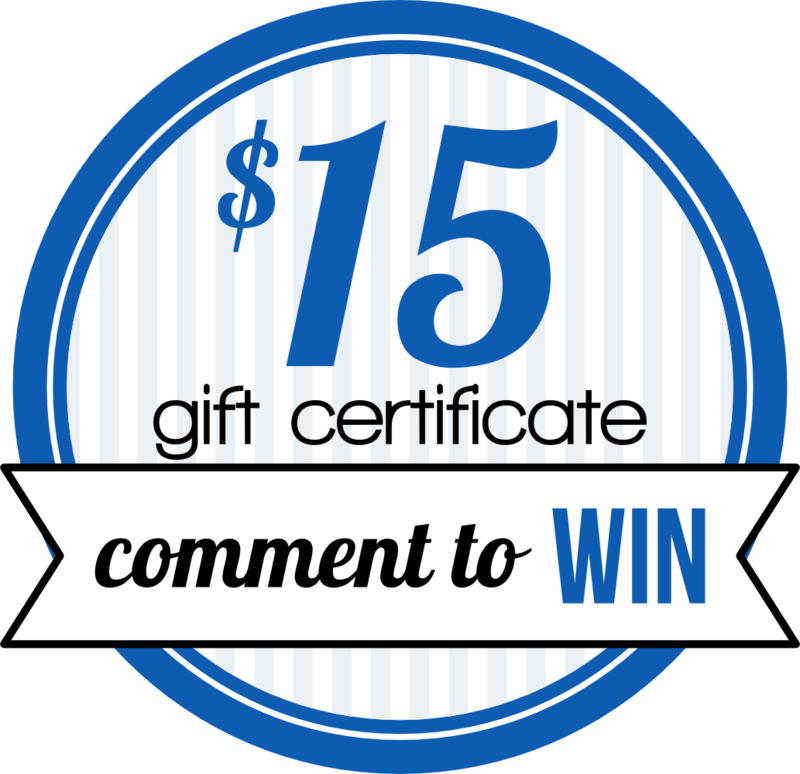 There are three $15 gift certificates to the LID store up for grabs, so the more blogs you comment on, the better your chances are of winning! 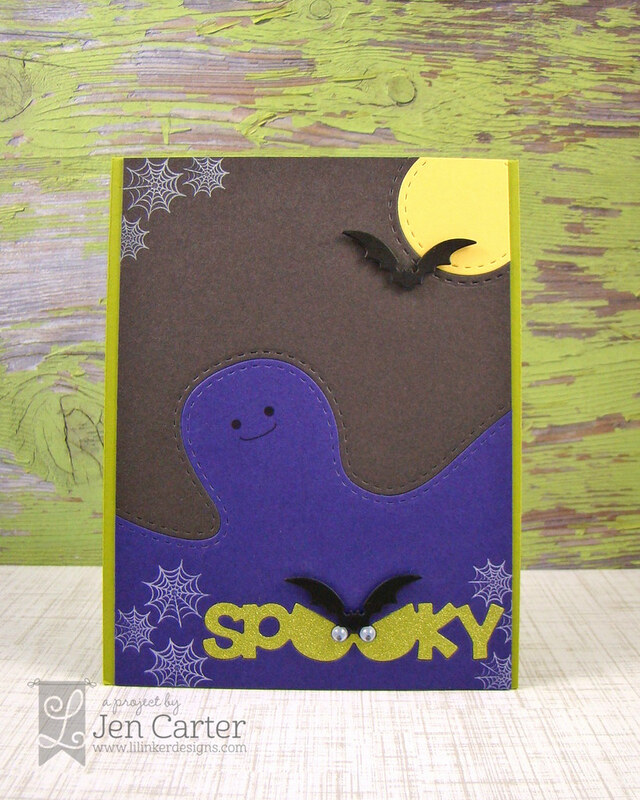 This card features the new Stitched Ghosts die set and the Boo & Faces stamp set. I die cut the ghost out of the Pinking Edge Sentiment Flag die and then layered a piece of patterned paper underneath. I stamped the large "boo" on the flag in melon ink. I added in some cardstock stripes for a little extra texture. I really like how the ghost isn't the traditional "ghost" or Halloween colors. This is a bag I shared last week for the LID & Timeless Twine promo. But in case you didn't see it then, here it is again. You can find the details here. 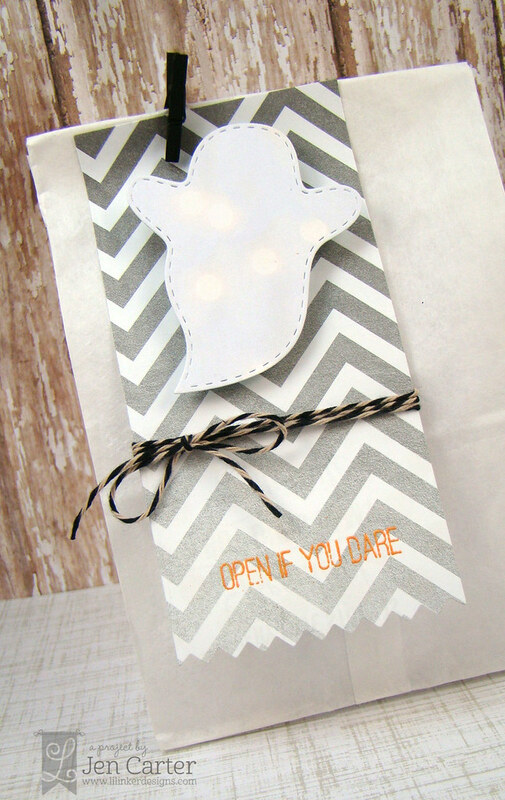 I cut the ghost out of bokeh patterned paper to get that lighted look. Hi everyone and welcome to the first sneak peek day of the Clearly Whimsy August Release! 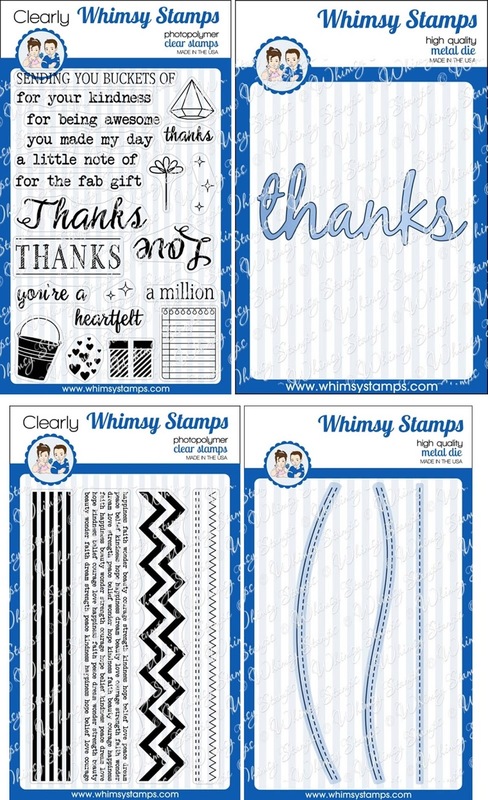 Over the next 3 days we will reveal the new August 2014 Clearly Whimsy Stamps products. We are releasing 3 new clear stamp sets and 4 dies/die sets this week, and they will be available to buy from the Whimsy Stamps store and selected Whimsy Stamps retailers on Saturday. This month we are thrilled to welcome Iris Wiechmann as our Guest Designer. Iris will be joining us for our 3 day release event and sharing her wonderful creations featuring our August release. Welcome Iris! 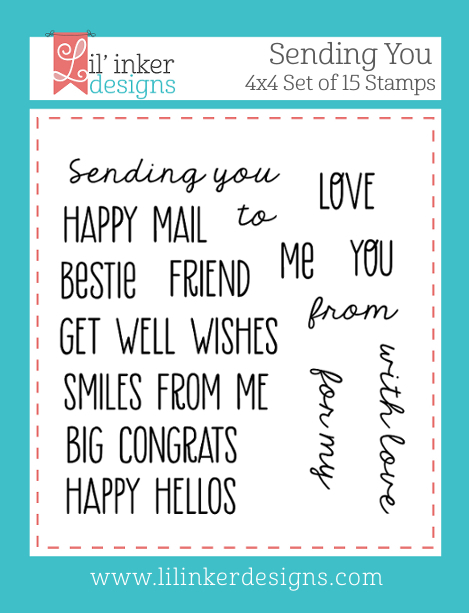 Today we are revealing the Thanks A Million 4x6” stamp set and Basic Backgrounds & Borders 1 4x6” stamp set, together with the Thanks large word die and the Stitched Borders die set. Hop on over to the Whimsy blog for more details. This is such a fun release! 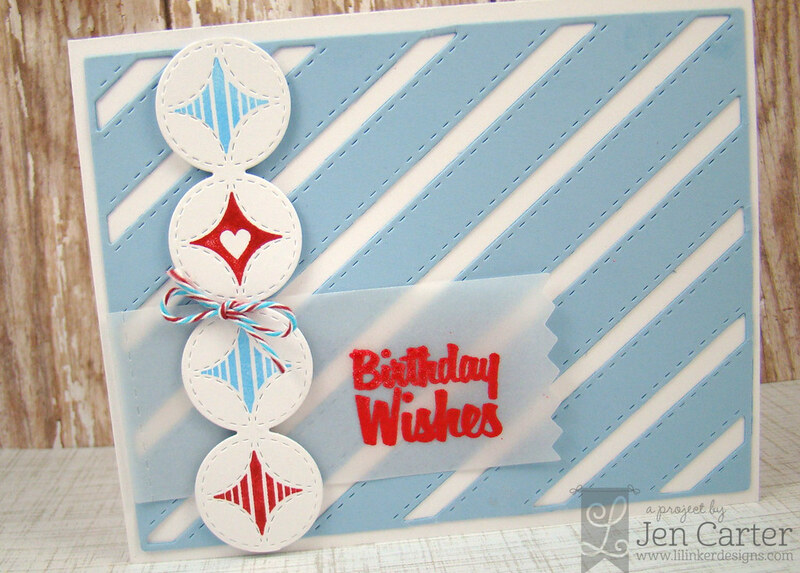 For my first card I used the new Stitched Border Trio die set. I used all three dies on this card. 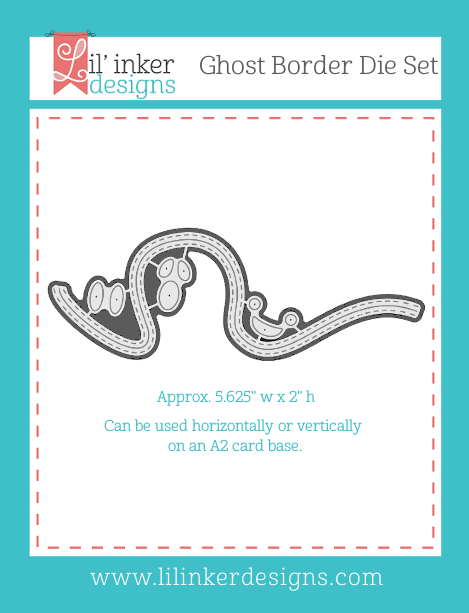 There is a straight border that stitches just a stitch (it doesn't cut an edge, just cuts the stitches), a curved die perfect for making shaped cards and a "hilly" border that has a "swoosh" to it! :) I used those dies to create my background. 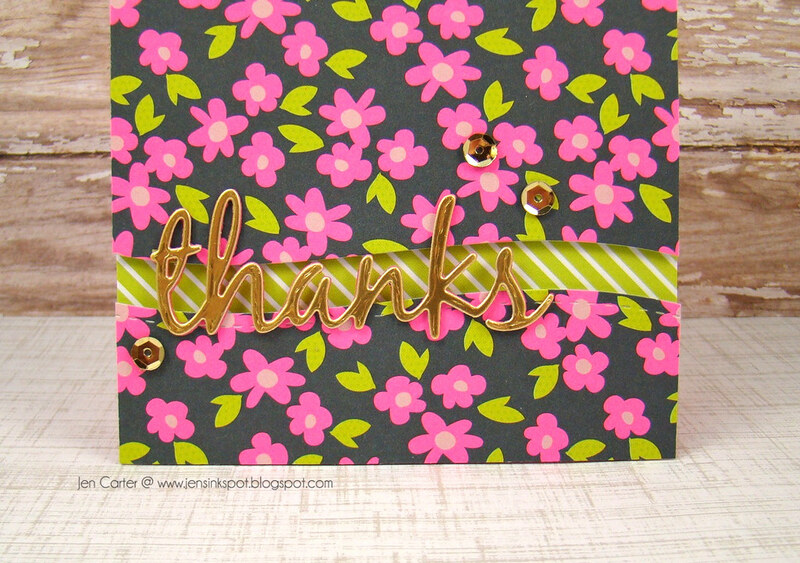 Then, I used the cool new Thanks Large Word die to cut my thanks with glitter paper. 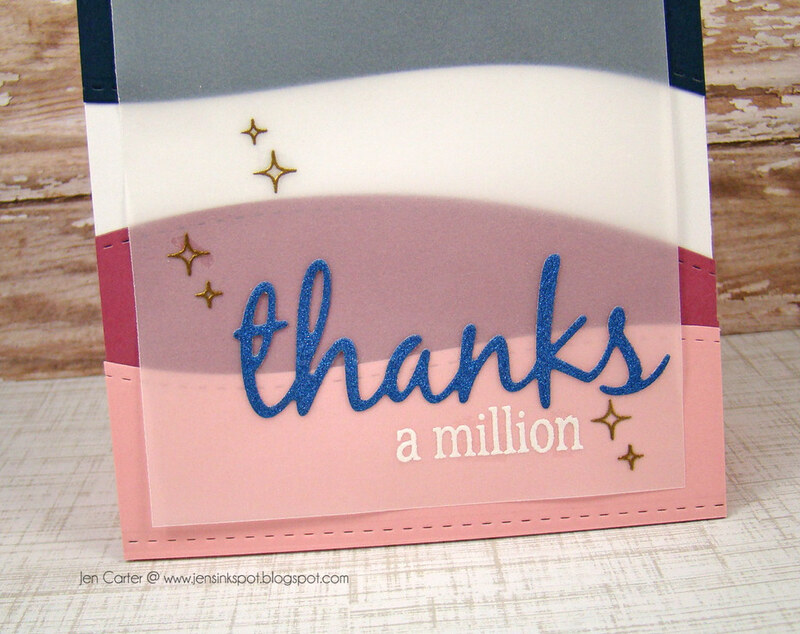 I embossed the "a million" and the little twinkling stars from the new Thanks a Million stamp set. What a fun combination of products! For this next card I was inspired by this pin for the color combination. 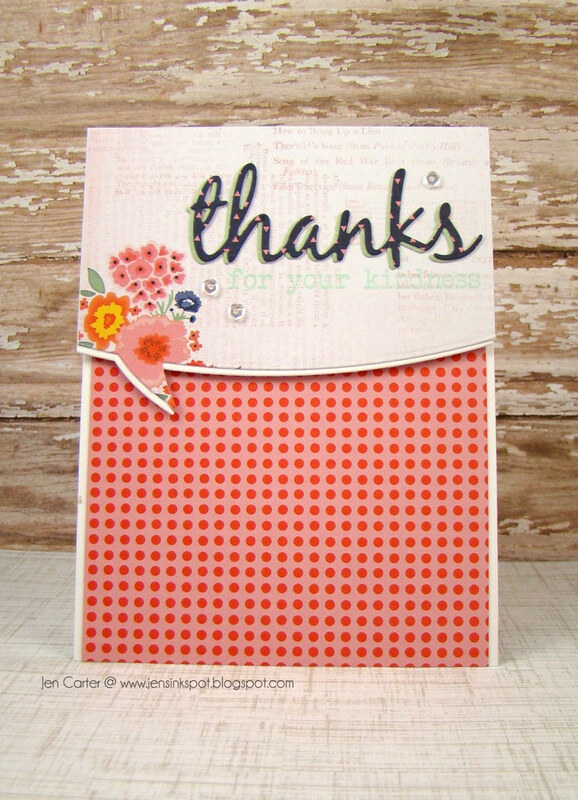 I started by stamping the chevron border from the new Basic Backgrounds & Borders 1 stamp set. 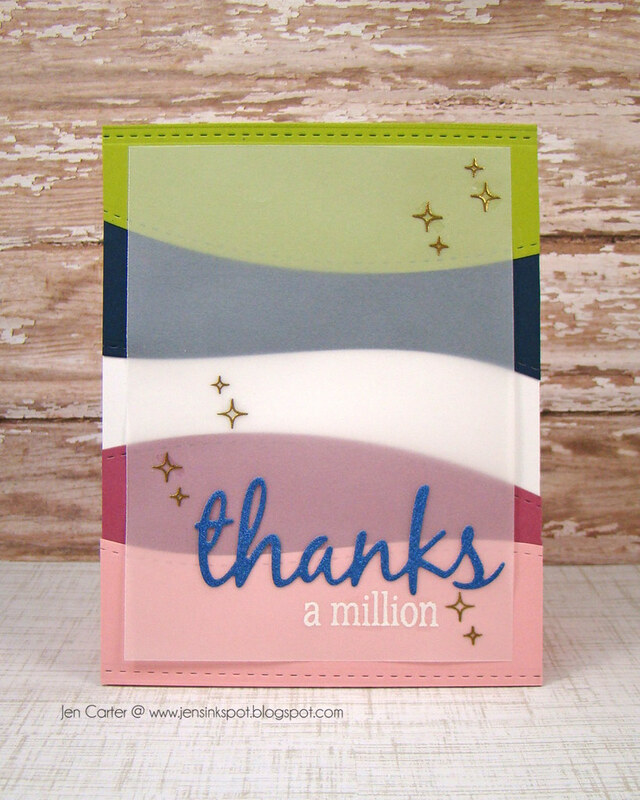 I embossed the sentiment in silver that is included in the Thanks a Million stamp set and also embossed the cute little notebook paper from the same set. I added Rainbow Teal Shimmer twine from the Twinery. 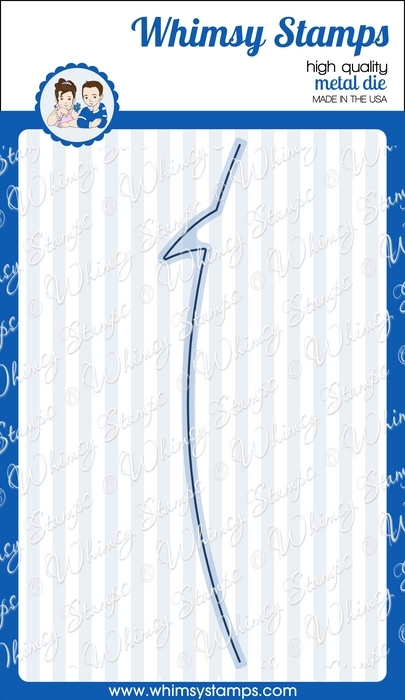 I thought that this card could be used for a teacher, especially if it were stamped in school colors! Hello again and welcome to Day 2 of the Lil' Inker Designs August Release! All of the spooky products being shown today are currently available in the Lil' Inker Designs store already! 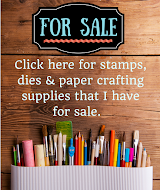 If you are following along in the blog hop you should have come from Heather Campbell's blog and if you'd like to start at the beginning, visit Laura's blog! 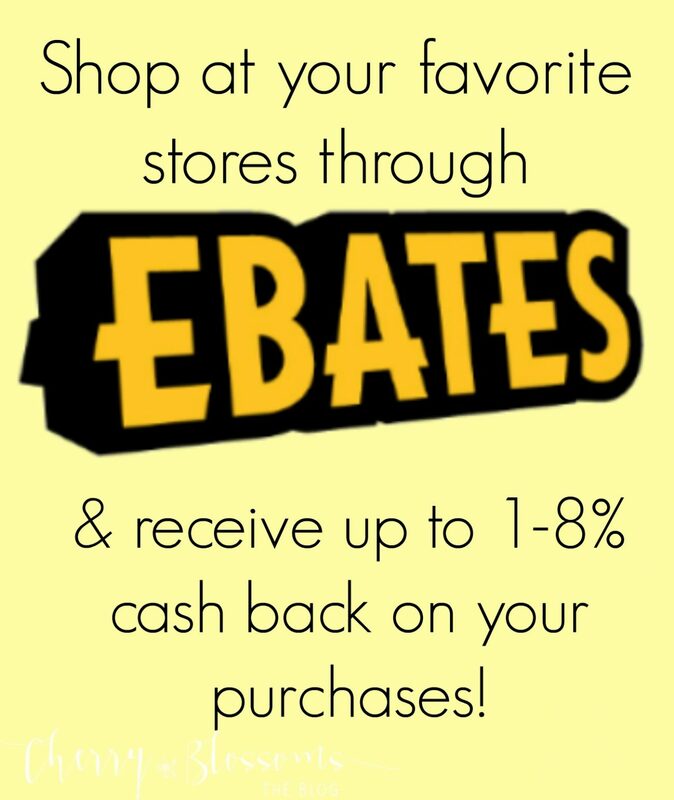 There are three $15 gift certificates to the LID store up for grabs, so the more blogs you comment on, the better your chances are of winning! 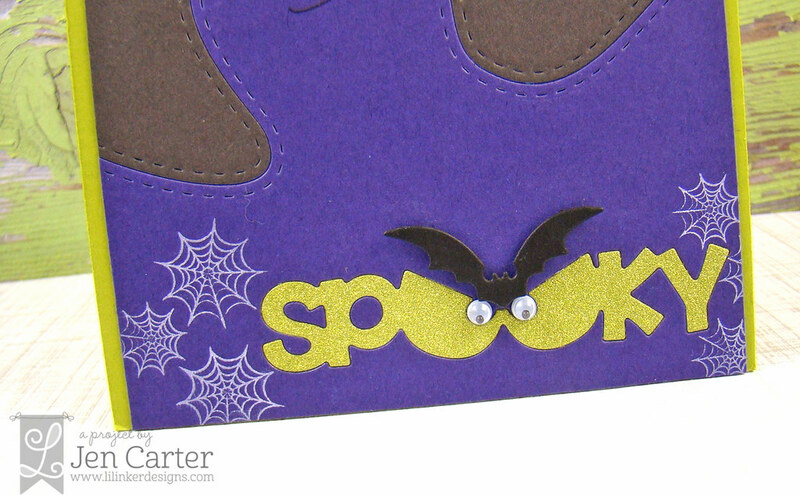 The first card I have to share with you uses a fun new Ghost Border die set! The ghost border includes several sets of eyes. I used one of the eye dies to cut random holes in my black cardstock and then added yellow cardstock and black rhinestones behind them. 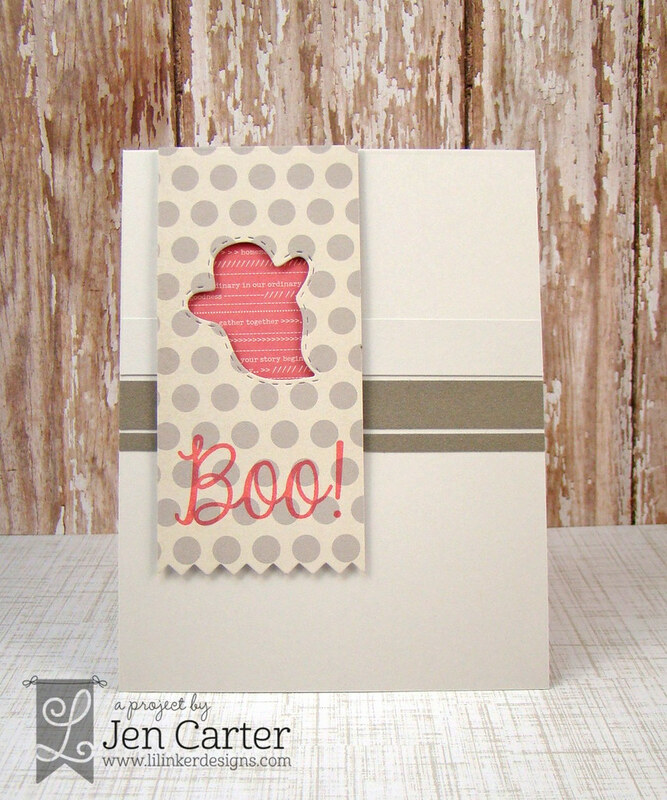 The sentiment is from another new stamp set called Boo & Faces. Here I embossed it in orange. This next card features several new products! Here you see the largest portion of the Ghost Border Die Set in action. In real life that ghost is purple, a true Halloween purple, not this weird blue that my camera captures. 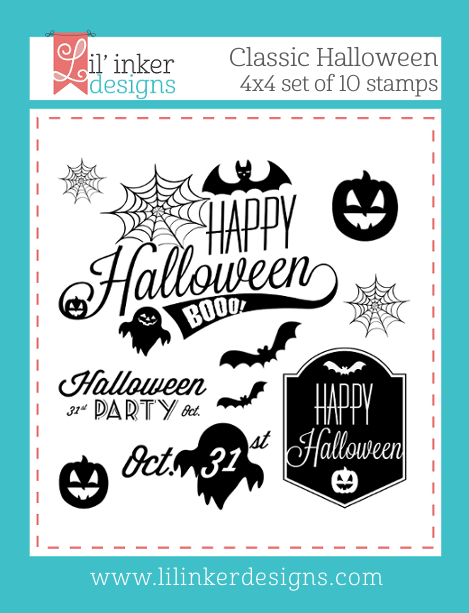 I stamped several sizes of spiders webs from the Classic Halloween stamp set. 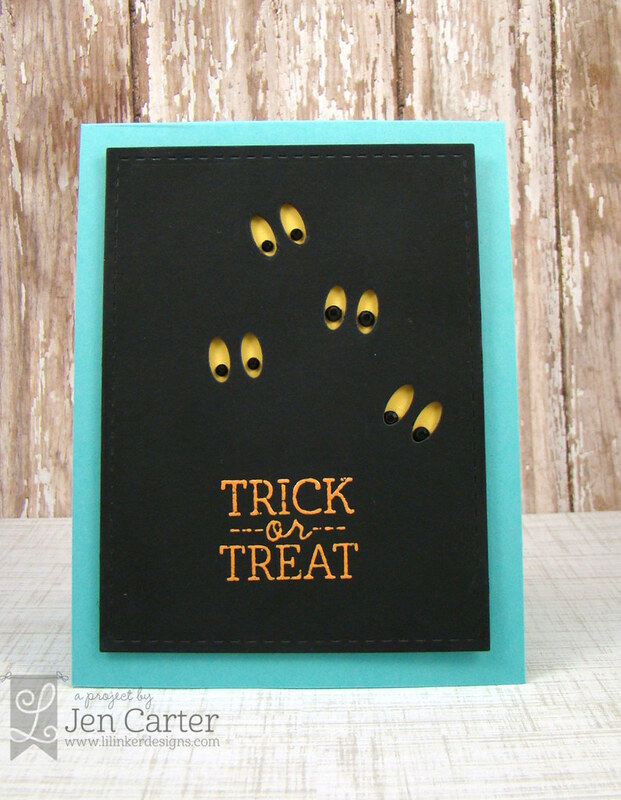 I also added a moon with Stitched Mats: Circles dies and a bat from the Bats & Broomsticks die set. This bottom portion of my card is my favorite! I have another card to share sometime later that also features this pairing. 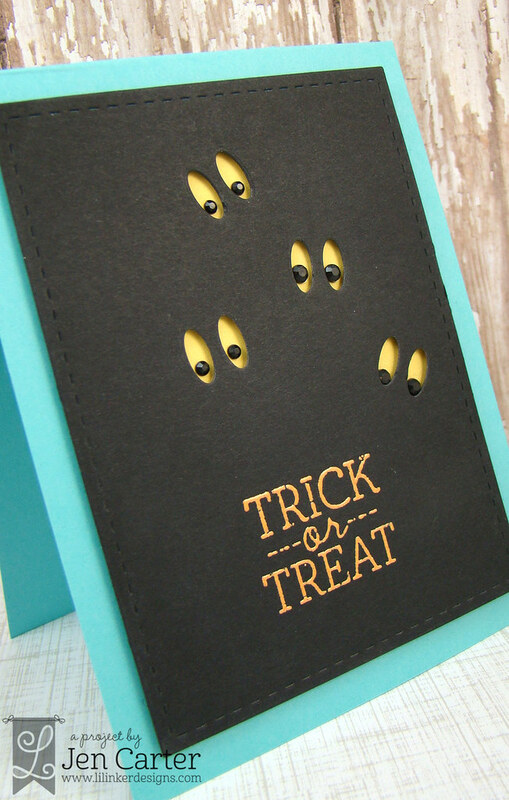 I used the super fun Spooky Eyes Word die with green glitter cardstock and then added two googly eyes. I added another bat on top of the eyes and it makes it look like a spooky creature or hairy eyebrows (however you see it). Such a fun discovery! 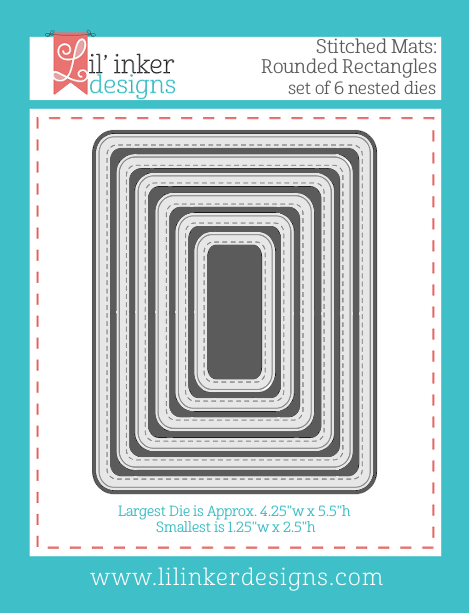 Don't forget about the super fun new die set that is also being released this month, Stitched Mats: Rounded Rectangles available in the Lil' Inker Designs store now! 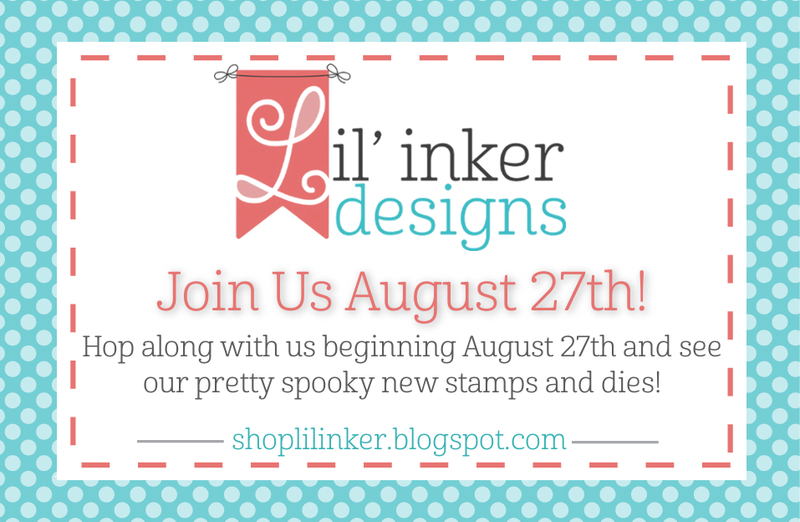 Hello and welcome to the Lil' Inker Designs August Release! As you've come to expect from LID there are some fun, fun new products being released this month, you won't be disappointed! All of the products being shown are currently available in the Lil' Inker Designs store already! If you are following along in the blog hop you should have come from Heather Campbell's blog and if you'd like to start at the beginning, visit Laura's blog! There are three $15 gift certificates to the LID store up for grabs, so the more blogs you comment on, the better your chances are of winning! Today I have a card and envelope ensemble to share with you. 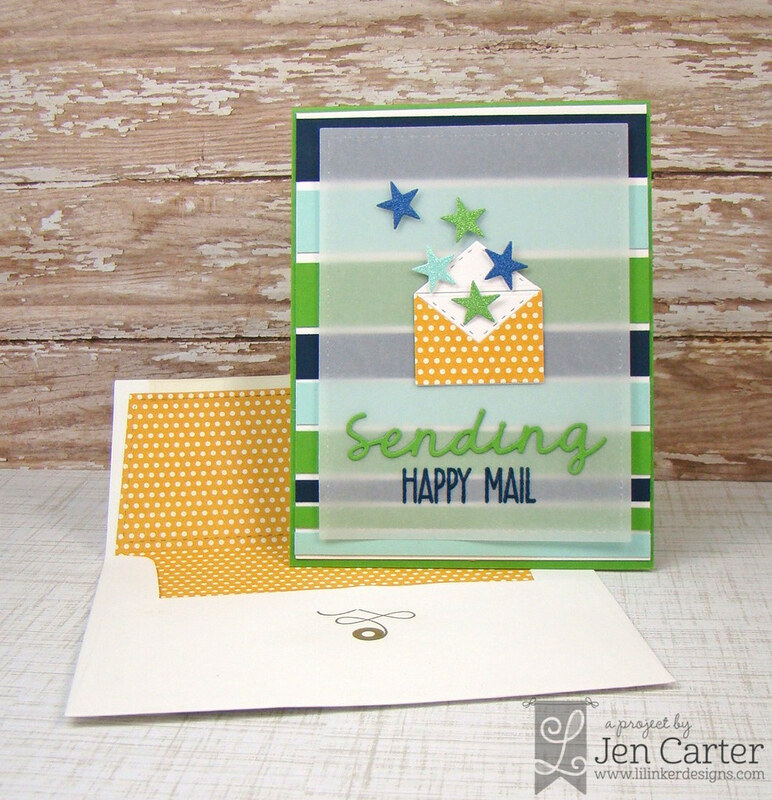 There is a cool new Stitched Envelope Liner Die that makes your envelopes so pretty and adds such a nice surprise for the recipient when they open up their envelope! Did you catch that it is STITCHED! So fun! 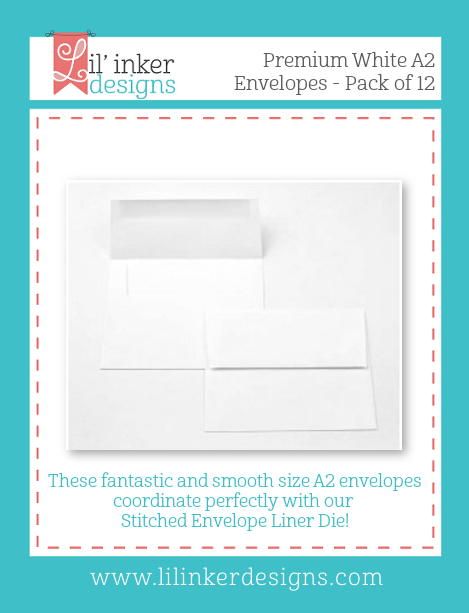 Along with that there are some wonderful quality envelopes in the LID store now too! They are nice and smooth and almost seem semi glossy. To continue on with the envelope theme, there are some cute, cute new envelope dies and stamp sets to go along with them, including new word dies which everyone seems to love (me included). For this card I cut my vellum with the Stitched Mats Rectangles dies to partially cover the stripes. 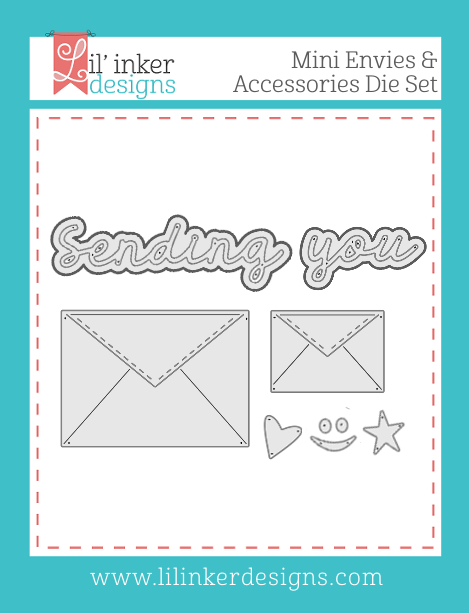 I embossed the "Happy Mail" sentiment from the new Sending You stamp set and adhered the "sending" word die that is included in the Mini Envies & Accessories Die set . 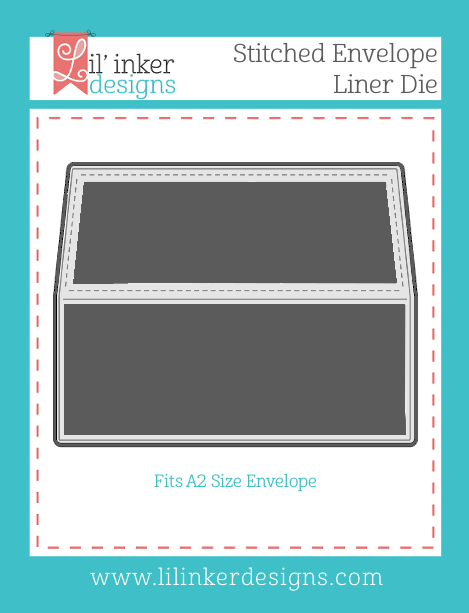 That little envelope is the smallest in the Envie Die set. To make this envelope appear to be open, I cut it out once with the yellow polka dotted paper, and then twice with white paper. I layered the yellow paper on top of one of the white die cuts (with the yellow flap piece cut off to show the white "inside") and then cut the flap off of the 2nd white die cut envelope and attached it like an open flap. The stars flying out of the envelope are also from the Envie die set! 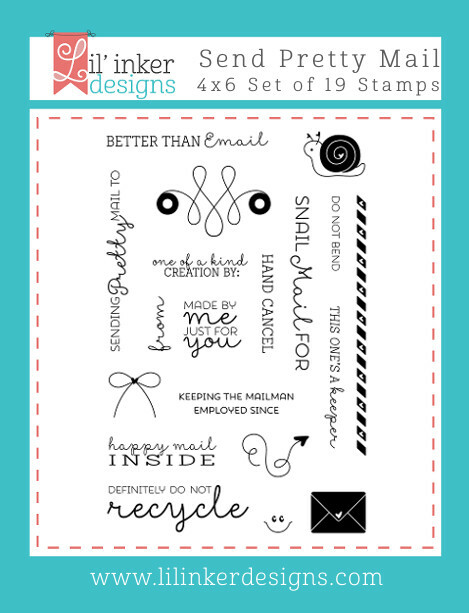 There is another cute stamp set that coordinates with these new envie products called Send Pretty Mail. 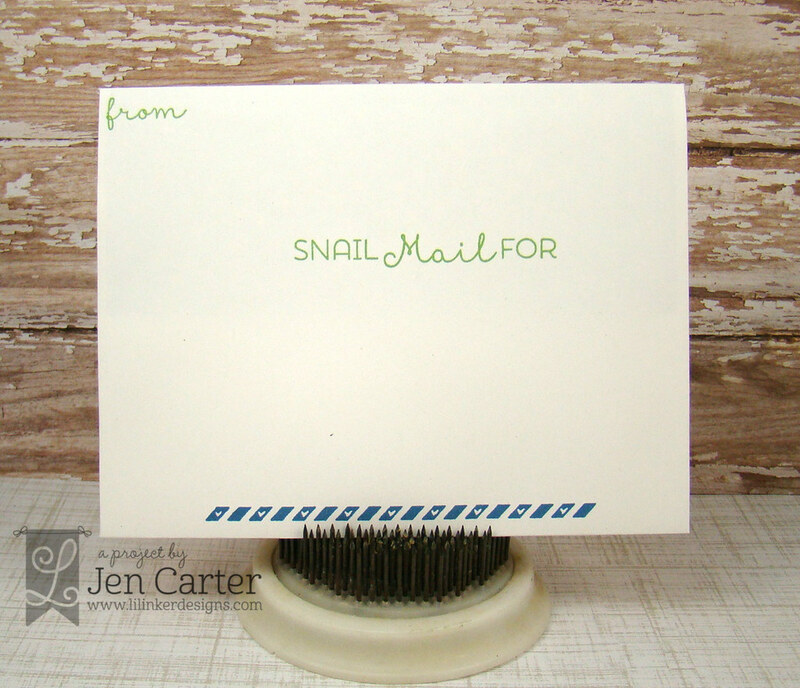 It is such a wonderful creation and is intended to help you dress up the outside of your envelopes, but there are lots of ways to use these on your cards too! There are lots of different options and I kept my envelope fairly simple and in line with the colors I used on my card. Of all the stamps in the Send Pretty mail set, this is my favorite! I HAD to use it on my envelope. 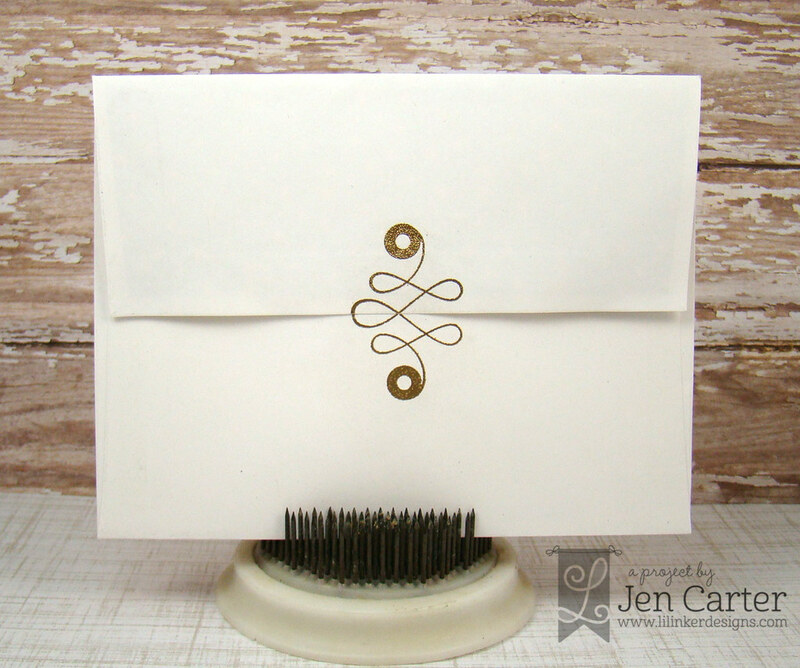 I embossed it in gold and it just adds an elegant little touch to the outside of the envelope. AND...there's one more little secret! 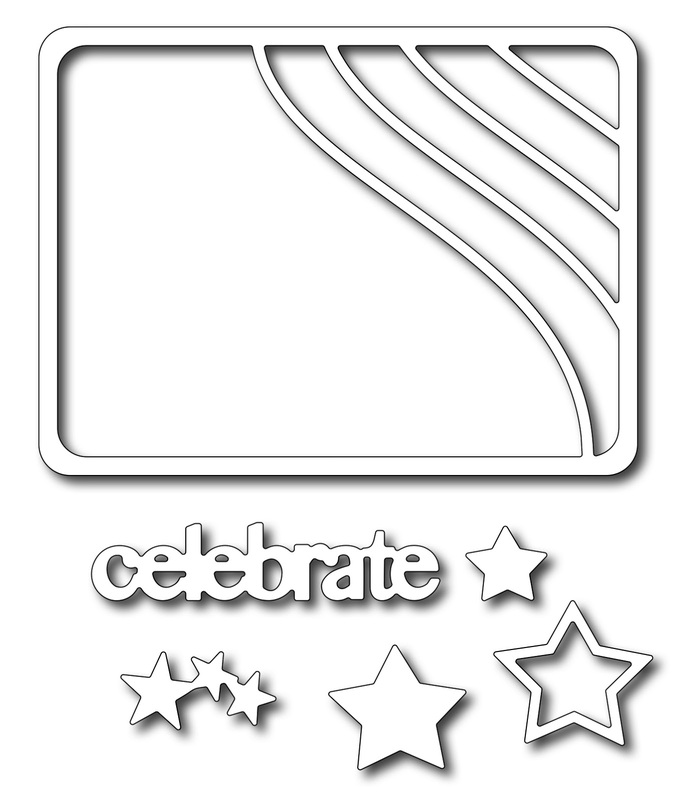 To celebrate LID's 4th Anniversary, a die set, by popular request, is also available! Stitched Mats: ROUNDED Rectangles!! Yea!! How cool is that? These are sure to be hot, hot, hot so get yours now while you still can at the Lil' Inker Designs store! Don't forget to comment to win! The more blogs you comment on, the better your chances are of winning! There's plenty more inspiration to see using these sets and we'll be showcasing projects through Wednesday! Your next stop on the hop is over to Karen's blog! You can see the entire blog list below! Hey all! This is going to be a very busy week on my blog! To get things started off I wanted to share another project I created using Frantic Stamper dies! This die, called the Stars & Stripes Photo Card, has so many uses! For this particular card I went with a patriotic theme. I actually created this card several months ago around the 4th of July so it seemed very fitting at the time. I had so much fun playing with various patterned papers and trying to decide which ones to use and where. 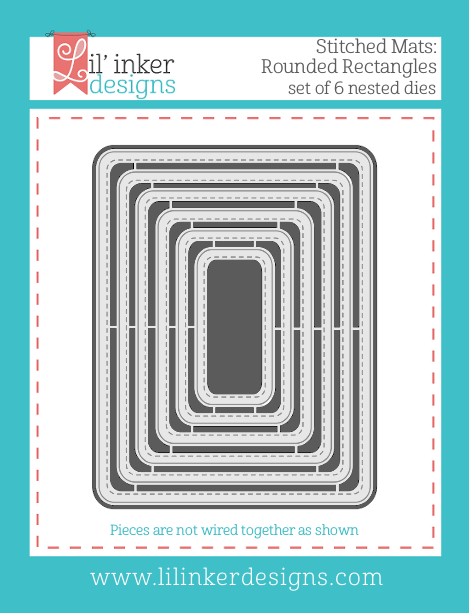 Most of the die cuts that you see on this card are included in this one die set! I love that! And if you enjoy Project Life, these photo card dies are the perfect size for the pockets! I started the card by die cutting out the frame with rustic white cardstock. 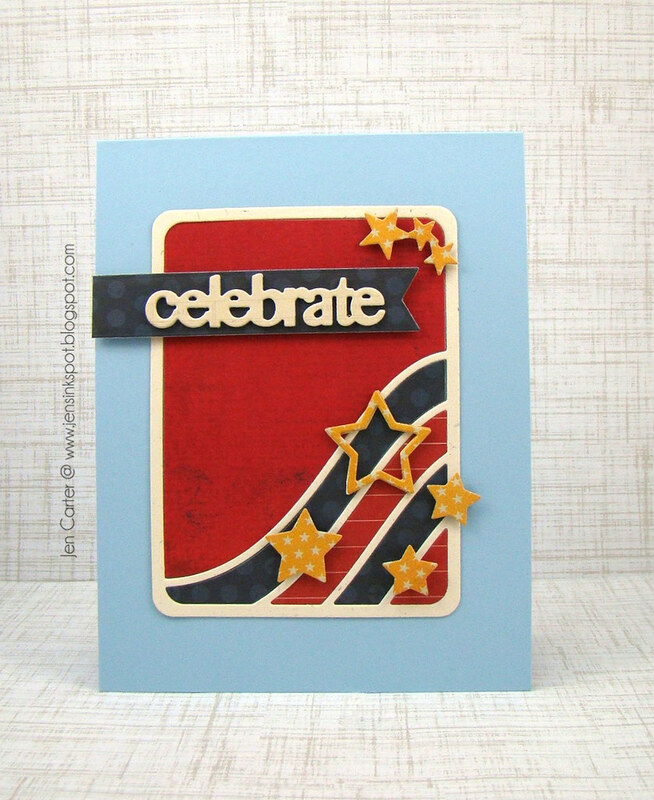 To make the celebrate, I die cut three of the celebrates with rustic white cardstock and then glued them together. I did the same thing with the large star with the cut out center to give it stability and as an easy way to add dimension without having to use dimensionals on the back which would have been hard to adhere with such thin lines. The other stars and the title banner were all popped up using dimensionals. Thanks for stopping by! Be sure to come back on Wednesday when I'll have more inspiration to share! Lil' Inker Designs has joined forces with Timeless Twine to provide you with a week full of inspiration. Each of the Design Teams will be sharing projects using both Lil' Inker Designs & Timeless Twine products. Each company will be giving away PRIZES! Lil' Inker is offering a $25 gift certificate and Timeless Twine is giving away a $20 gift certificate! Winners will be chosen from the comments left on the blogs so be sure to leave some love as you hop this week! My first project for today features Black Kraft Bakers twine. I love the colors of this one! And guess what? It's on sale! You only pay $8 for a whole 160 yard roll! Here I used the twine as an accent to my tag. 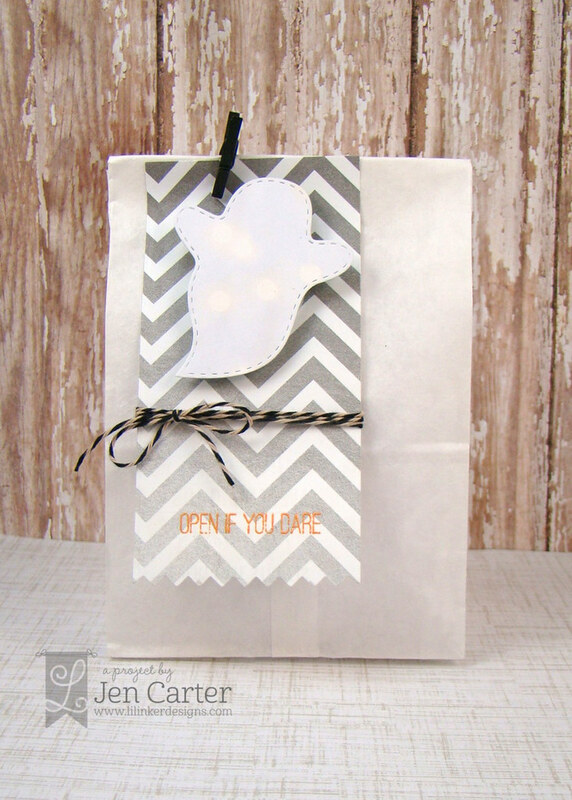 My gray chevron tag was cut using Lil' Inker Designs Pinking Edge Sentiment Flag die set. This bag also features some sneak peeks of some new Lil' Inker Designs products that will be available next week, beginning Wednesday, August 27th. You won't want to miss that reveal! 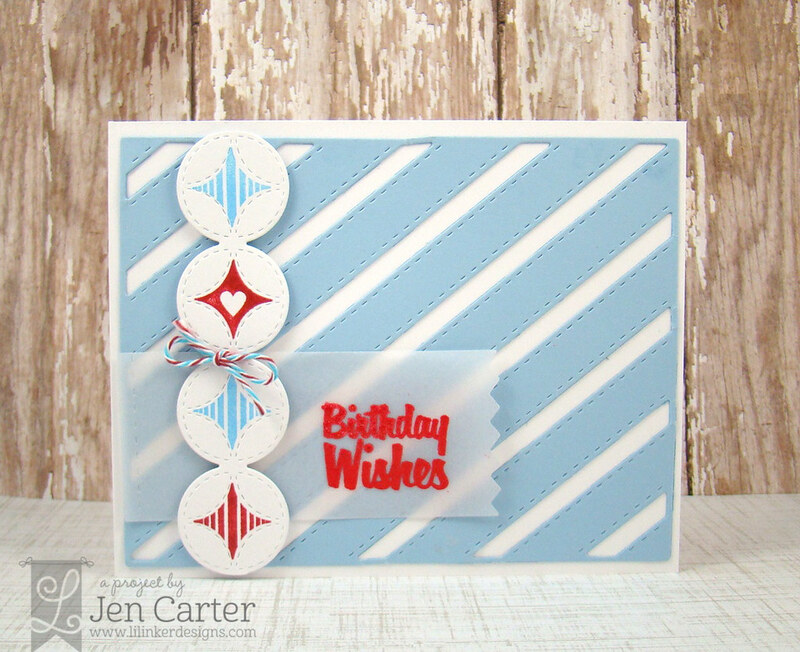 My 2nd card features the twine as an accent. Just because it may be small, doesn't mean it doesn't pack a punch! I love, love, love the colors of this twine! It is called Aqua Blue & Red twine and it is also on sale for $8 for an entire roll! I used quite a few Lil' Inker products on this card. 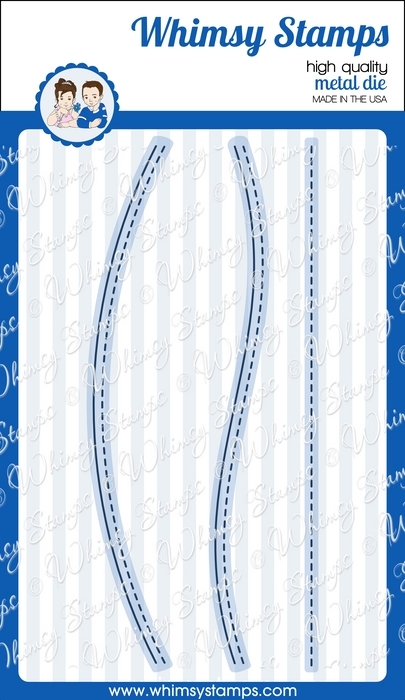 I started by cutting the striped background with the Cover Up Die: Stitches & Stripes. I then used the Circles & Diamonds Stitched Pattern Die and the Connected Circles Die to make the circle strip down the side. I stamped the diamonds with the Darling Diamonds stamp set. I next cut the vellum flag with the Pinking Edge Sentiment Flag die set and stamped the sentiment from the Fancy Feathers Stamp set. 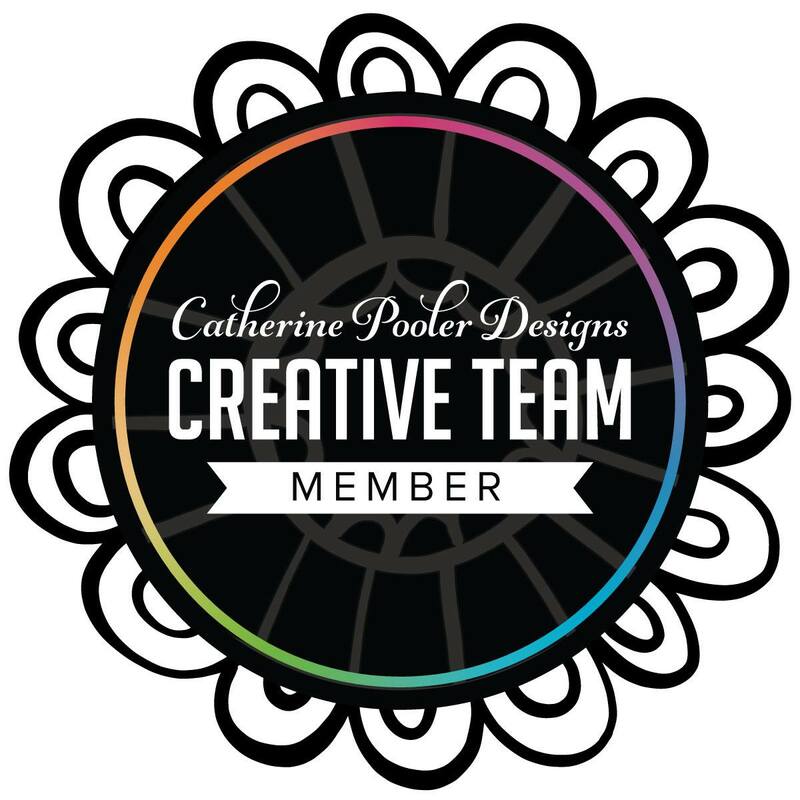 Be sure to visit the other designers who are playing along today! There will be more inspiration tomorrow too starting at Erin Schreiner's blog!